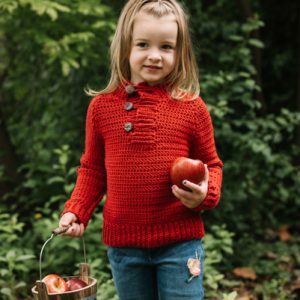 Inspired by bright colored apples, sunny autumn days and crisp fall air, this Appleghan captures the essence of Autumn without being drab. 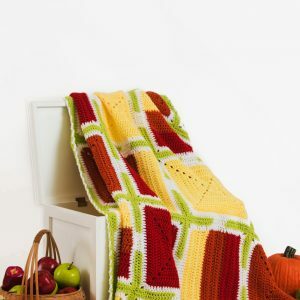 Made up of different squares, each week you’ll learn how to do a different motif for this amazing afghan. Head outdoors in a cozy sweater with accents of deep McIntosh Apple red. You’ll want to cozy up with this sturdy cardigan all season long. 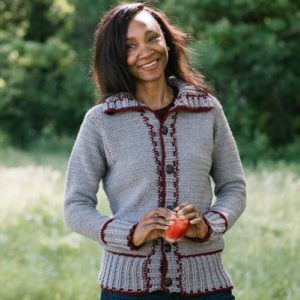 Dark red yarn with a touch of purple works to create a shawl that’s reminiscent of the skin of a fresh, Macoun apple. 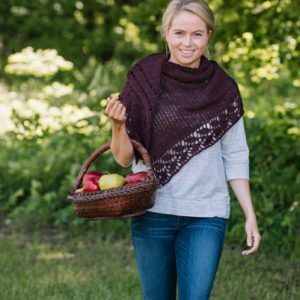 Complete with a single row of apple leaves just towards the shawl’s edge, this design is ready for your next apple picking adventure! The ever-classic Red Delicious apple inspired this ruana to make a perfectly modern accessory. This comfortable and easy-to-wear project is a sweet and stylish way to make sure you stay warm this season. Best of all, it’s beginner friendly! 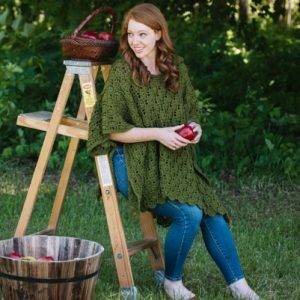 Inspired by Crispin apple leaves, this refreshing take on a poncho is here for the apple picking season. The leafy structure of this design paired with a wool and acrylic blend yarn gives this poncho breathability and warmth at the same time. Wear with or without the hood depending on how crisp the weather may be. 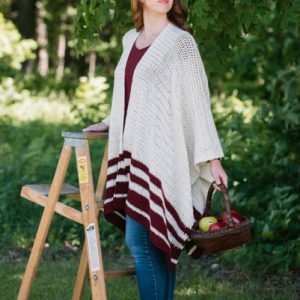 A hooded poncho with a peacoat style and a buttoned front is an apple orchard dream come true. 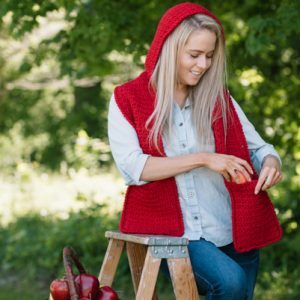 Beautifully crocheted in red, this poncho is in part inspired by tart Cortland apples. This sweet and Red Riding Hood-esque scarf is inspired in part by the heavenly Ambrosia apple. The scarf can be worn with the hood up or down and the hood has a rounded top to create a more wearable design. Large pockets will keep hands warm, making it the perfect accessory to see you through from fall to winter.